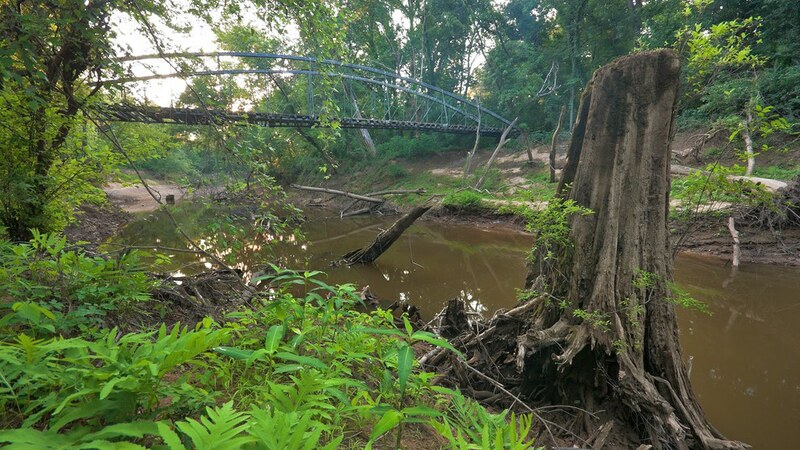 The oldest bridge in Arkansas still stands to this day; spanning the Cadron near Springfield, Arkansas. Brian Cormack and I visited it for the first time way back in February of 2011; then again in June in the dead middle of summer on a hot and humid day. The bridge itself has some pretty neat history, and is the only of it’s type still standing in Arkansas. The Springfield Bridge is nominated under Criteria A and C. Under Criterion A, this bridge is the last remaining 19th century cast and wrought iron bowstring arch bridge and the oldest documented highway bridge in Arkansas according to a recent Arkansas Highway and Transportation Department study. It is one of only two 19th century highway bridges in existence and is possibly one of the first all metal truss bridges in the state. The Springfield Bridge is also significant under Criterion C. It is an unaltered example of a cast and wrought iron tubular arch bridge that was patented in l861 by Zenas King and Peter H. Frees. It was manufactured by one of King’s companies, the short lived King Iron Bridge Manufactory and Iron Works of Iola, Kansas, in 1871. King created one of the largest and most diversified bridge building operations in the United States in the last decades of the 19th century. He is credited with using extensive labor saving devices and the standardization of several manufacturing processes to develop the first practical and simple system to mass produce metal bowstring bridges in this country. The Springfield Bridge is a significant example of Zenas King’s contribution to 19th century civil engineering in the United States and to the history of 19th century bridge construction in Arkansas. The Springfield Bridge itself is not complete across the entire span. Very old wood planks attempt to provide a way across, but only the brave should even venture onto this bridge. Even so, The latest comment from Bridgehunter.com suggests this bridge had caught fire mid-summer last year. I may have to revisit it again sometime to see how it’s still holding up. Back in 2011 Brian and I made the observation that it probably wouldn’t be around much longer. Now that it’s been through a fire, I imagine it’s life is drawing to a close. Regardless, it is a fascinating piece of Arkansas history and I’m glad to say I’ve preserved a bit of the soul of the old Springfield Bridge in this photograph captured way back in the summer of 2011.